Mike Thomson, Chief Executive Office of The LGBT Community Center of The Desert, dropped by my podcast studio recently to talk about the 6th Annual Center Stage Gala happening this week. 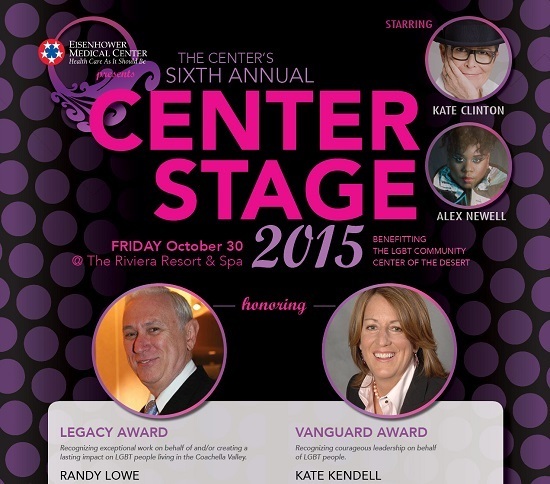 Randy Lowe and Kate Kendell are to receive the Legacy and Vanguard Awards respectively at this year's 6th Annual Center Stage Gala to be presented by Eisenhower Medical Center, and held on Friday, October 30th, announced Brian Rix, Chairman of the Board, today. Randy Lowe is being "recognized for his exceptional work on behalf of and creating a lasting impact on LGBT people living in the Coachella Valley", said Rix. Since 2008 Randy Lowe served as the Board Chair of The Center, and its predecessor the Golden Rainbow Senior Center, until he recently stepped down, and now serves in a consultant capacity as Board Chair Emeritus. He joined the organization to create a counseling program but quickly worked to reorganize The Center to be a full service community center for the entire LGBT community. A graduate of the University of Portland, Lowe also received graduate degrees in Public Administration with specialties in executive development and organizational behavior from the University of Northern Colorado (1977) and the University of Southern California (1988). Lowe spent his career was with the Federal government working for the Mine Safety and Health Administration, Federal Contract Compliance Programs, and as a Clinton appointee as Chief of Staff concentrating on civil rights work. Following his governmental work, he served as the Diversity Officer and Senior Vice President for Employment at Union Bank in San Francisco, where he achieved the recognition for the bank by Fortune magazine as the best company in the US for diversity in 2000, and by the Federal Government with the Opportunity 2000 award as the best company in America for affirmative action. Upon retiring in 2008 he moved to Palm Springs and joined the Board of the Golden Rainbow Senior Center. In his seven years at The Center, Randy has shepherded the organization through a complete reorganization of its mission and programs, reaching out to all sectors of the LGBT community that serves over 3,000 people a month. Kate Kendell is receiving the Vanguard Award for her courageous leadership on behalf of LGBT people. Kendell leads the National Center for Lesbian Rights, a national legal organization committed to advancing the civil and human rights of lesbian, gay, bisexual, and transgender people and their families through litigation, public policy advocacy, and public education. NCLR's legal, policy, and legislative victories set important precedents that improve the lives of all LGBT people and their families across the country. Projects and Legal Issue Areas Include: Asylum & Immigration; Elders; Employment; Family & Relationships; Federal Legislation & Policy; State Legislation & Policy; Hate Crimes; Healthcare; Housing; Low Income & Poverty; Prisons; Rural Communities; Sports; Transgender Law; and Youth. Kate received her J.D. degree from the University of Utah College of Law in 1988, and after a few years as a corporate attorney she was named the first staff attorney for the American Civil Liberties Union of Utah. In this capacity, she oversaw the legal department of ACLU of Utah and directly litigated many high-profile cases focusing on all aspects of civil liberties, including reproductive rights, prisoners' rights, church/state conflicts, free speech, and the rights of LGBT people. In 1994 she became Legal Director with the National Center for Lesbian Rights in San Francisco, and in 1996 its Executive Director. In that capacity, she assists in the development of litigation and strategy, and is responsible for all aspects of agency operation. In her work, Kendell has appeared in hundreds of media outlets including the New York Times, Washington Post, Good Morning America, CNN, and dozens of on-line blogs. Center Stage will open with a Reception & Silent Auction at 5:30 PM, followed by a sit-down Dinner and Entertainment at 7 PM, hosted by the quick witted Kate Clinton and concert by Alex Newell, the powerful and mesmerizing singer best known for his starring role as transgender student Wade "Unique" Adams on the musical comedy-drama Glee. "We are thrilled to honor these two remarkable individuals, and have such incredible talent come and support The Center," said Rix. "The support for this line-up and the work of The Center is overwhelming. We are thrilled to have Eisenhower Medical Center return as our Presenting Sponsor and David Hood & George Sellers as Premier Sponsors. Center Stage will begin with a Reception & Silent Auction at 5:30 PM, followed by Dinner and Entertainment at 7 PM, at the Riviera Palm Springs, on Friday, October 30, 2015. For more information, visit TheCenterPS.org. For information on how to pitch guests to the show and column, visit NicholasSnow.com. To be alerted of new episodes, follow me here on HuffPo, at Facebook or on Twitter.